There are two new features in the InstantEncore mobile suite which further expand your ability to control the look and feel of your mobile app. For the past three years, the InstantEncore mobile suite has had a single streamlined theme with white text over your custom background image or color. Given the constraint of white text, this style theme was intended to include a darker background image or color to provide strong contrast to the text. 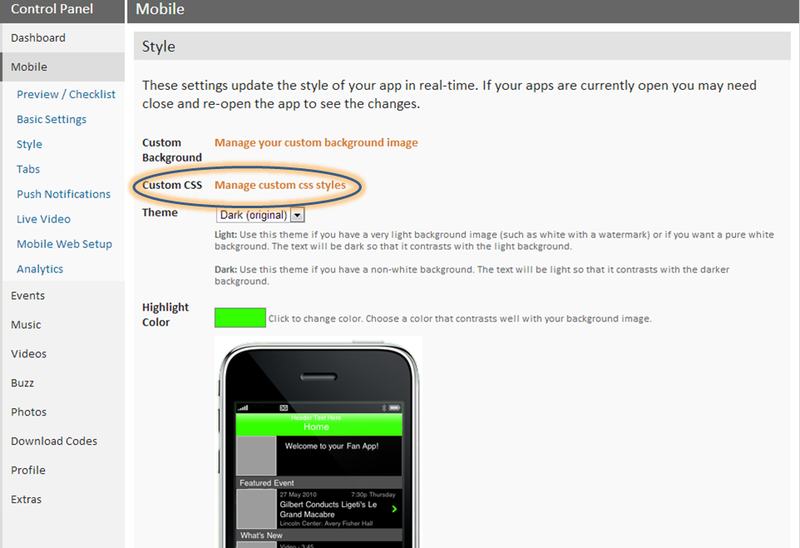 Correspondingly, this original theme is known as the “dark” theme. 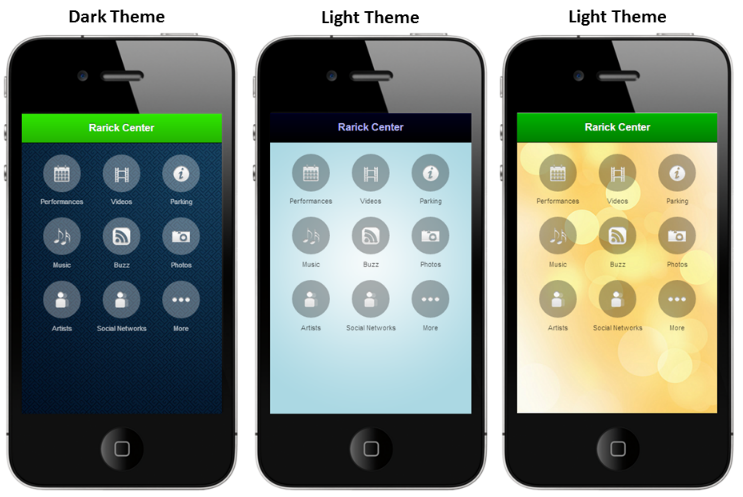 One of the new features in the mobile suite is the addition of a “light” theme, featuring black text and intended to be combined with a lighter (or even white) background image or color. 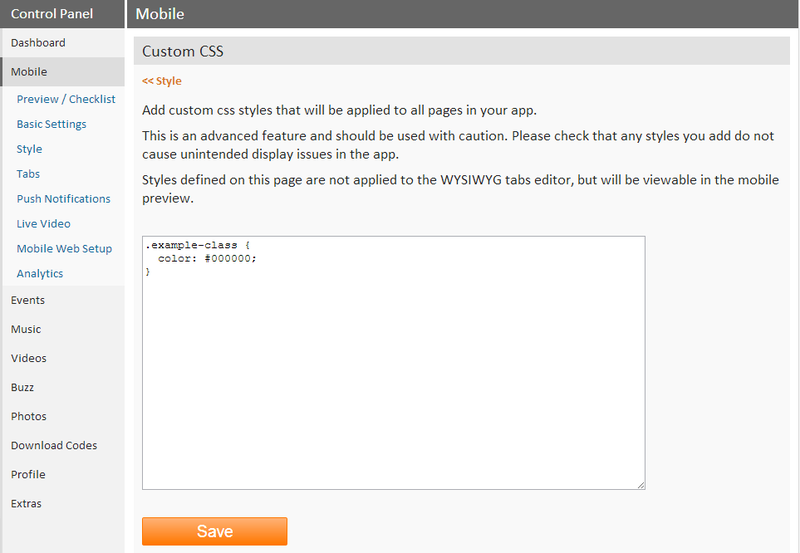 The other new feature added to the mobile suite is a Custom CSS tool which allows you to set style and formatting preferences for custom content tabs you create for your mobile app. By creating custom tabs in the mobile suite, you are able to create content areas in your mobile app to meet the specific needs of your patrons. CSS (Cascading Style Sheets) allow you to change the style or presentation of HTML code in these custom tabs. The CSS Tool is an advanced area of the control panel and should only be edited by someone with previous CSS and HTML experience. If you do not have this previous experience, then please consult a web designer before making any changes to this area. If you have any questions about either of these new features, or any other elements in the control panel, please contact us at support@instantencore.com.